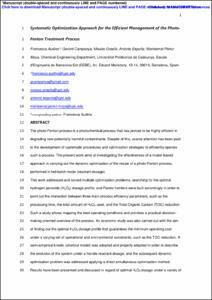 Audino, F., Campanya, G., Pérez-Moya, M., Espuña, A., Graells, M. Systematic optimization approach for the efficient management of the photo-Fenton treatment process. "Science of the total environment", 1 Gener 2019, vol. 646, p. 902-913.